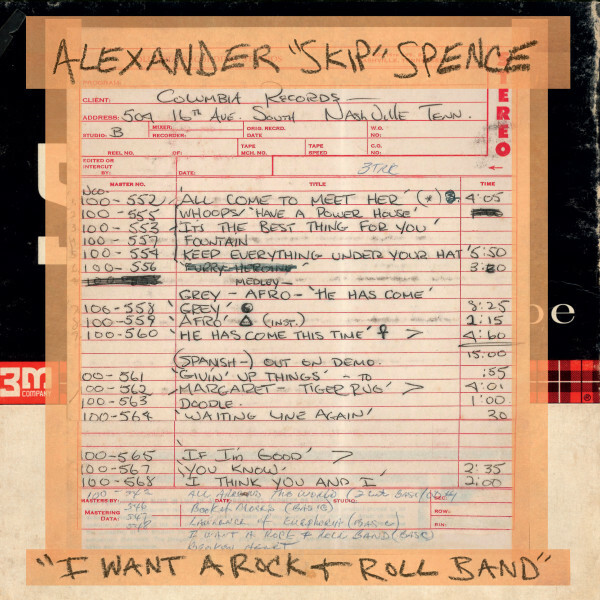 Special 45rpm single by Alexander 'Skip' Spence. Excerpt from the triple-LP 'AndOarAgain' with 3 tracks released in conjunction. In a sense, Skip is now a one-man rock & roll band. A few months ago, he was in a band, but now he's on a different path. On one of today's tracks, he opens with a low growl, "I want a rock & roll band." He then sighs, perhaps wishing he didn't have to do it all himself. After repeating the phrase, he adds, "One that spits fire and chews blood!" Skip was in that sort of band just a few months earlier the talented but jinxed Moby Grape. It's like he was writing a note to himself, thinking about his old band, thinking about himself as a band, and perhaps thinking about other bands as well. Maybe he was also writing a reply to the Byrds, who once sang, "So you want to be a rock & roll star." Like the Byrds, Skip was grounded in folk music. Twenty months ago, Moby Grape opened for the Byrds at the Fillmore and Winterland in San Francisco. They’d rehearsed tirelessly for days-on-end beforehand. But Skip doesn't want to go back to his past. "I don't want the Fillmore," he roars, "I want a rock & roll plan." While his future may be unclear, Skip is on a mission to record everything he has in his body & soul. For a part of that Sunday so long ago, that included, I Want a Rock & Roll Band a song that features so many of Skips hallmarks, wit, spontaneity, wordplay, a mixture of intricate & percussive guitar, verve, & a beautiful falsetto. It's a rollicking snapshot of where Skip Spence was at, smack dab in the middle of his Oar sessions one cold Sunday in Nashville, Tennessee. Customer evaluation for "I Want A Rock & Roll Band - I Got A Lot To Say - Mary Jane (7inch, 45rpm)"